From the Robert P. Coggins Collection, Exhibited: “Auburn Collects: Selections from The Ed Hayes Collection”, Jule Collins Smith, Museum of Fine Art, Auburn University, Feb. 4, 2012-Apr. 28, 2012. Born/lived: Harper’s Ferry, VA, Blowing Rock, NC (studio) and NYC. Known for: painting poetic, mystical landscapes. In the 1890s he created religious paintings and murals, and a number of views of the Grand Canyon in his later years. He visited Europe in 1897 and 1924, painting scenes of Venice. He wrote books on Inness, Ryder and Blakelock. Studied: with George Inness (whose NYC studio adjoined his), 1880; with Walter Satterlee; Arts Students League. 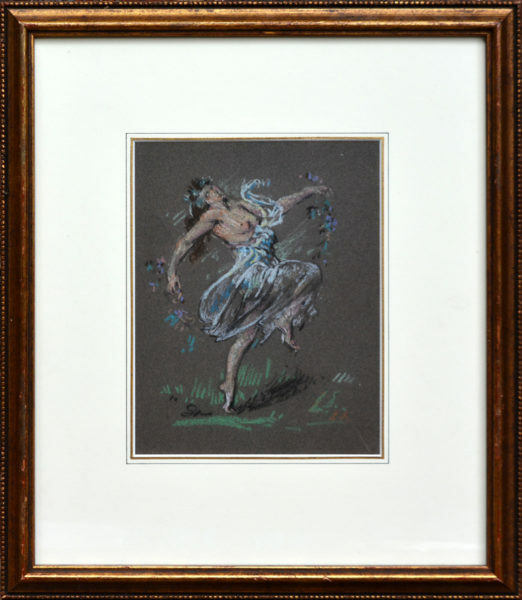 Member: Associate member of the National Academy of Design, 1902; National Academician, 1906; New York Watercolor Club, Society of American Artists; Lotos Club; National Arts Club. Exhibited: National Academy of Design, Brooklyn Art Association, Boston Art Club, Pennsylvania Academy of Fine Arts, Corcoran Gallery, Art Institute of Chicago. Work: Metropolitan Museum of Art; Toledo Museum of Art; National Gallery, Washington, DC; Brooklyn Museum; Church of St. Mary, NY; City Art Museum, St. Louis; Art Institute of Chicago; Butler Art Institute; Los Angeles County Museum of Art. Comments From the Robert P. Coggins Collection, Exhibited: “Auburn Collects: Selections from The Ed Hayes Collection”, Jule Collins Smith, Museum of Fine Art, Auburn University, Feb. 4, 2012-Apr. 28, 2012.